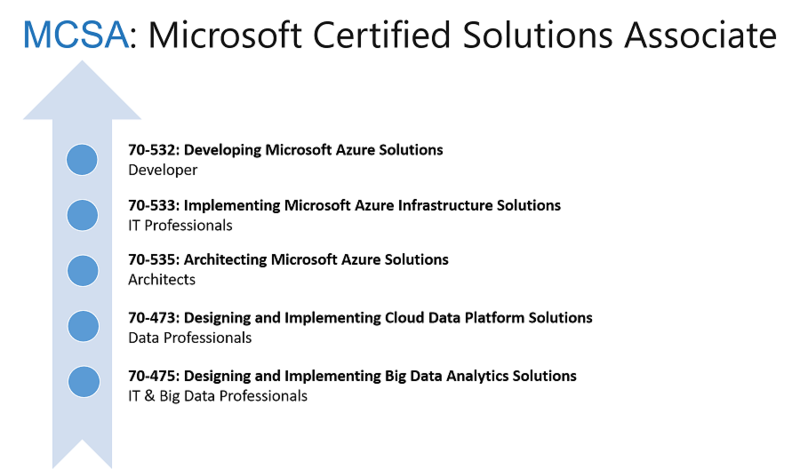 In this blog article, I will explain about Microsoft Azure certifications. As per the current market trend, IT professionals with knowledge and experienced in Azure are in high demand. Based on the job role, professionals can decide their certification in Azure. 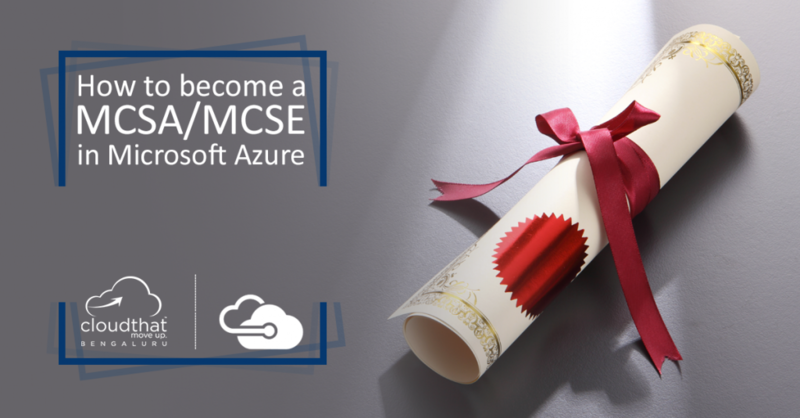 Microsoft offers MCSA and MCSE certification specializations in Azure; individuals can upgrade their skills with below certifications. Which certification track suits your job role? 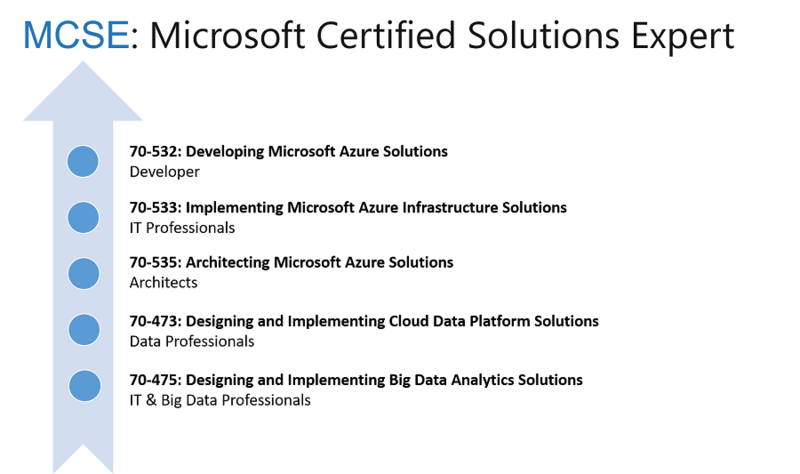 How can I prepare for Azure certifications? 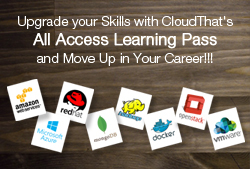 You can prepare for Azure certifications with CloudThat’s course offerings. These courses are designed for achieving latest exam objective of Azure certifications. As per my observation, Microsoft has changed their exam objectives almost 3 times in the year 2016. We at CloudThat updated those changes regularly and maintained track of course objectives. All the certifications are focused on latest services and ARM concepts. How to appear for certification? You will get Test Prep voucher to perform mock test and practice with more than 100 questions. Hi I would like know being in sales and i have good knowledge on Azure as i have been a part of the azure Sales Team, looking forward to become expert in azure , can you help me with this suggesting me which course will be better for my profession. Thanks for writing. As per your sales background you should go ahead with 70-534: Architecting Microsoft Azure Solutions certification track. Hello, I have already completed certification for 532, 533 & 534. so I can assume now I am MCSE? Reason I am asking this because, I have pass results for all the 3 exams, but have not received any congratulation KIT from Microsoft (Not sure if Microsoft still sending such kits like they used to send it 10 years back). The process is same, if you can login with MCP details you will get access to all the details. Under the dashboard of MCP page you will see all the details. I am from a system admin background, and now looking for a change in Cloud platform, for Azure the system admin people should go to 70-533 and 534 respectively, now since do not have much knowledge of cloud and also powershell, would it be difficult for me to understand the concept for 70-533 and 534 also after completing the certification how much probability will I have to get a decent job ? So understanding of concepts almost same, only the difference is how the services going to be provisioned in Cloud and how it works. So if you are already working in the same field, I don’t think so there will be any challenges. Certification you have chosen is the perfect one. I am trying to reach your team, but hard luck. Wanted to go for more than one exam voucher. Wanted to know about any discounts or offer, along with voucher validity. Also link shared by you, leads to details page, wherein ‘Location’ field is mandatory but not loaded with any values. Thank you for your interest in exam vouchers, you can buy more vouchers. Let me know how many exam vouchers you are looking for. I have sent you email separately for the same. If i purchase a vocuher for the exam, can i take the exam in other country? I may be travelling soon to Australia, so will I be able to use this voucher to appear for exam there? You have to appear for exam via person center. As per my understanding Microsfot has different policies and price for countries. So as of now this voucher works in India I believe. I along with 3 of my colleagues are planning on acquiring MCSD in the near future. Can you let me know if the exam vouchers can be purchased in bulk and some details about the practice test whether its based on the old syllabus or new. As per Microsoft’s latest update, now they have updated specialization as MCSE and not MCSD (this was old certification). So if you are planning to become MCSA or MCSE you can select exam accordingly. Also, regarding exam voucher you can buy in bulk. Let me know number of quantities you are looking for. Regarding practice test, questions mapped with latest exam objectives because it’s keep updating so. Many participants purchased voucher and cleared the exam. Please let me if you need any further informaion. i am SQL Server DBA and planning to move Azure cloud specially on database admin side which course i must take, your help will he highly appreciable. Thanks for sharing such an informative and useful information which is very important for me. Hi team, I am from ecommerce platform background and I have little knowledge on Azure. I have 6 years of support experience and I wanted to switch my career path to Azure. Will 70-533 exam help in getting a decent job? Can you suggest me for which certification i should go for as i am fresher. Hello Neha, Microsoft has launched new role-based exams and corresponding certification tracks. Depending on whether you are from a sysadmin or developer background you can start with either Exam AZ-100 or AZ-200 respectively. Read more about it here.